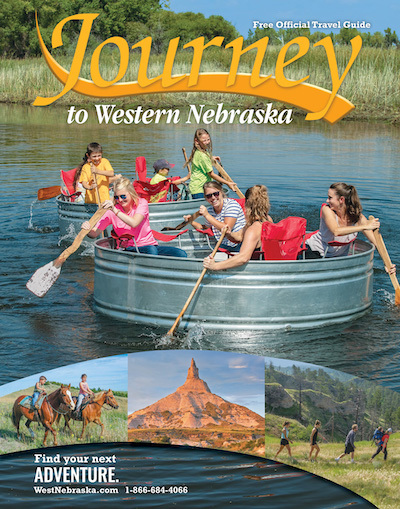 Explore the scenic beauty of Western Nebraska through outdoor adventures and historic attractions. Western Nebraska is divided into four distinct regions, each rich in history, culture and outdoor adventures. Pine Ridge – Scattered with pine forests and tree-covered ridges Nebraska’s Pine Ridge region is a rocky and rolling region. Rich in Military and Native American history along with majestic scenery, this region is teeming with wildlife including elk, deer, and bighorn sheep, as well as fossils, epic railroad vistas and outdoor ventures. Sandhills & Scenic Rivers – Many believe the Sandhills to be the most beautiful part of Nebraska with its grass-covered sand dunes stretching to the horizon. While it’s of the largest grass-stabilized dune regions in the world, water is actually a large feature. Thousands of prairie pot-hole lakes with waterfowl and fish, as well as the Niobrara River which is recognized as one of the 10 best canoeing rivers in the United States. The Platte River and Loup River also cut through this region which abounds in opportunities for kayaking, canoeing and tanking. Trails West – Thousands of emigrants traveled the Oregon Trail in the 1800s. While crossing the vast plains landmark formations like Chimney Rock, Scotts Bluff, and Ash Hollow became important mileposts for pioneers. Experience the region where the wagon ruts are still visible and the history comes alive as you follow the path of the pioneers in the Trails West region. Wild West – The Wild West region is filled with big adventures. From a 35,000 acre lake brimming with water sport opportunities to the world’s largest railroad classification yard. From the wild west of cattle drives, to gold strikes in the Black Hills. This is the region where Buffalo Bill Cody got his inspiration for the world renowned Buffalo Bill’s Wild West show. Live large here where big adventure awaits.